Between the mail and a lovely visit from Jessie, the girls and her mom...some fun baby treats have arrived in our home in the past few days. I'll spread them out over two posts (and why not? I certainly don't have any crafting to post about!). 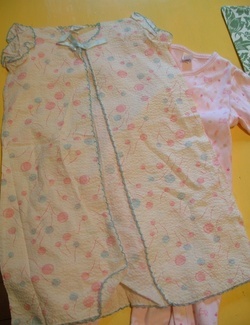 And here starts an amazing gift package from Jacquie, otherwise known as "jessie's mom" (who really must start her own blog--we'd all just drool over her amazing vintage finds and wonderful words and spirit to match).Let me tell you that Jacquie is as lovely, and kindhearted and warm as her daughter, and vice versa--I'm so terribly fond of the two of them, and feel quite blessed to know them. And this gift of sweetness is so perfectly "me", I was giddy opening it (even in the chaos of FIVE children running around), and poured over the contents several times throughout the day after they left. 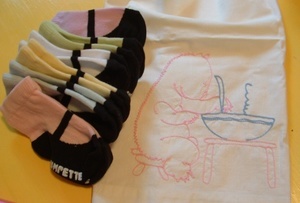 So, above, is a sweet embroidered piece, and some cutie pie mary jane socks! And this book! 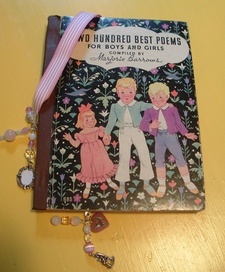 Two Hundred Best Poems for Boys and Girls. Such a beautiful cover, and lovely illustrations inside too. Beautiful. Yumminess!! 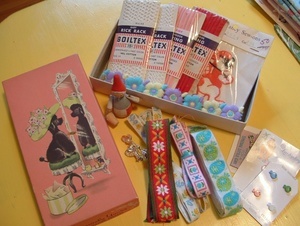 A box full of vintage trim, buttons, ribbon, pins, and more. YUM! This is where I get slightly orgasmic. Look at that pattern! 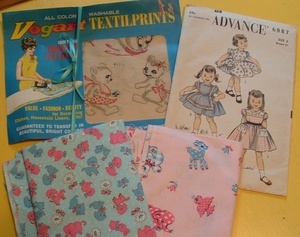 And the vintage fabric! And the transfers! 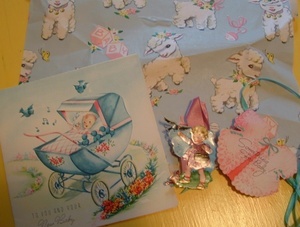 And look at this loveliness in the details--the wrapping paper, card, stickers. Ah! Ah! Thank you, thank you, Jacquie. Such a lovely treat for Adelaide and I to share.